My name is Gracie Rose, but my foster mama, Anty Barb, calls me Miss Scarlet Rose 'cause I have such gorgeous Red hair and some white too. I am just ten months old, but my life has already been enough for some senior 14 year old Tzu. I was bought by a family from a "breeder" in the "Dakotas" whatever that means. Things were going okay except those kids fed me some stuff that made my tummy get all messed up so I have to eat special food. Well, I was just getting used to that when I went out the door when one of the parents was leaving and thought I was going along. I guess they didn't want me to go because the next thing I knew that big round thing on the bottom of the machine we go places in, went right over my back end! Oh gosh did that hurt. I guess they figured I was stupid because "I didn't get out of the way." At least they took me to the clinic and the nice people their tried to fix me and gave me some pokes and sticks with sharp things. I got a little sleepy.but then I didn't hurt so much. But I heard my mom and daddy voices. They were talking quiet. ..............No we can't afford that, so just put her to sleep. Put me to sleep? I was so scared because then they left me. And then I couldn't stay awake, Why did they want to "put me to sleep? I guess there was an angel around, 'cause I woke up some hours later and tried to move but everything hurt, so I just panted cause it hurt and went back to sleep. To make a long story short I did get better, and the vet put my hip back in place and tapped me up. This wonderful lady was always brushing me and cuddling me and talking into a black thing about me and then was typing on a television thing and before I knew an even nicer lady came to see me. I heard her stay, I'll take care of her and I know someone who will help me get her fixed. Wow. These people really care about little broken puppers. I was so excited. So a few days later I was put in my kennel, took a long ride, then this other lady took me for a long ride too. And then we stopped and there I was. I could hear a lot of other puppers barking. Oh goodness I was excited! There was a lot of sniffing going on, but nobody growled or got mad at me. I went in my kennel where I felt safe and sat down to watch and think about this new place. 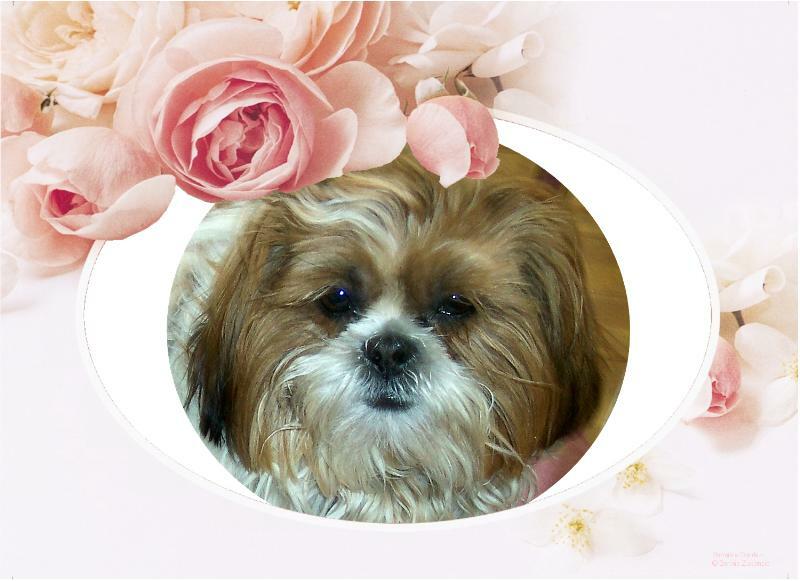 So that's how I came to the Shih Tzu Havn Hus and Mama Tzu Person, Anty Barb. She is going to get me all fixed again, as my leg needs surgery. It won't stay in place and just sort of hangs there. Dr. Noser says it isn't a bad surgery and in 10 days I'll be able to run and play again. Wow. That will be so cool cause there are lots of bird, rabbits, and squirrel's in Anty's back yard and her Crew isn't mean to me, but I just can't get them to play., yet!! I suppose it's because I always have a funny thing around my neck or go hopping like a rabbit. Anty says we need some help with the fixing. It's going to take about $1500 for all my bills, but I'm really worth it...........cause I'm so cute and so young and I just love everyone. Can you please help me out? Scarlet Rose was adopted! She has a new family to spoil and love her! Her foster mom misses her but knows she will be loved and allowed to be the Princess she is supposed to be in her new home! We wish to thankfully acknowledge all of Scarlet's Sponsors and Special Angels who helped us so much in providing funds to pay her vet bills. You all were her angels and your support meant more than you can ever imagine to her foster mom! Thanks to a lot of wonderful people we received enough donations to pay for all of her surgery bills and Scarlet's Rescue now becomes one of our Sponsor Success Stories! For you, the Sponsors are what made this rescue a Success! Alice Meredith and Bud Meredith who are always there in our time of need! Judith Wentworth donated to Scarlet's medical Fund! Peg Buehler donated to Scarlet's Medical Fund! Martha Di Girolamo donated to Scarlet's Medical Fund! Rob Wolcott donated to Scarlet's Medical Fund! Cam Kempton donated to Scarlet's Medical Fund in honor Doodle Bug! Joyce Long donated to Scarlet's Medical Fund in honor of Kuddles! Robin & Nick Lloyd donated to Scarlet's Medical Fund! Louise Montgomery donated to Scarlet's Medical Fund! Cheryl Martinez donated to Scarlet's Medical Fund! Lynn Dwiggins donated to Scarlet's Medical Fund! Marion Schneider donated to Scarlet's Medical Fund! Brenda Seiple donated to Scarlet's Medical Fund! Bonnie Shearer and her co-workers donated to Scarlet's Medical Fund! Mary Kay Jung donated to Scarlet's Medical Fund! Diana Chamberlain donated to Scarlet's Medical Fund! Lynnette Emerick donated to Scarlet's Medical Fund! Joan Saluga donated to Scarlet's Medical Fund! Janice Williams donated to Scarlet's Medical Fund! Deborah Reynolds donated to Scarlet's Medical Fund! Bobbi donated to Scarlet's Medical Fund! Jennifer Dickey donated to Scarlet's Medical Fund!